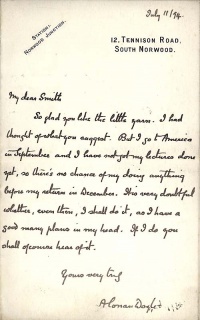 This letter was written by Arthur Conan Doyle on 11 july 1894 to Mr. Smith. So glad you like the little yarn. I had thought of what you suggest. But I go to America in September and I have not got my lectures done yet, so there's no chance of my doing anything before my return in December. It is very doubtful whether, even then, I shall do it, as I have a good many plans in my head. If I do you shall of course hear of it. This page was last edited on 29 December 2017, at 03:22.